As a believer in God who enjoys science and music, I found the following analogy interesting. This is from Professor Colin Humphreys’ lecture at Trinity College, Cambridge on the topic, “Can Scientists Believe in Miracles?” In this part of the lecture Dr. Humphreys seeks to balance the consistency of God in maintaining an orderly universe with the ability of God to intervene miraculously in the natural order. Overriding natural laws not only give scientists a problem but also theologians, and the reason for this is that the picture of God given in the Bible is of a consistent God. There are many biblical passages where the consistency of God comes through strongly. So theologically, if God created the Universe and is constantly upholding it, and if God is a consistent God, then would he override the laws he has established? Let me give you a musical analogy which may be helpful. Imagine you are standing behind a pianist who is playing without music and you are watching the pianist’s fingers. Every time the pianist goes to play the note “F” he plays “F sharp”. You can deduce from this the key signature of the music. The key signature is the rule the composer establishes for playing that piece of music. If you keep watching you may observe that, on occasion, when the pianist should play “F sharp” he plays “F”, or he may play black notes when you expect him to play white ones. These are what musicians call “accidentals” which the composer has deliberately put in the music. The composer, of course, is free to put accidentals in the music – he is the composer – and although he’s set up a key signature which signifies the way the music should normally be played, he is free to say that it should be played differently on occasions. If he is a great composer, the accidentals will never be used capriciously, they will always make better music. It is the accidentals which contribute to making the piece of music great. The analogy with how God operates is clear. God created and upholds the universe but, like the great composer, he is free to override his own rules. However, if he is a consistent God, it must make more sense than less for him to override his rules. Are You Sitting Rent Free? Creatures below us, and above us, bring glory to God; and do we think to sit rent free? Shall everything glorify God but man? It is a pity then that man was ever made. “Google is not God.” Well, I’m glad we got that squared away. 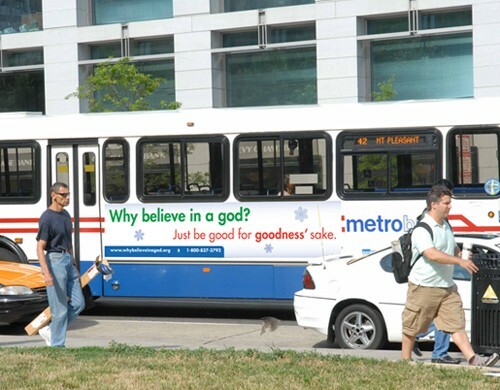 A group of humanists announced this week plans to plaster over 200 buses in Washington D.C. with ads bearing its “godless holiday” message. Ads proclaiming, “Why believe in a god? Just be good for goodness’ sake,” will appear on the outside and inside of DC Metro buses starting next Tuesday and will run throughout December. Newspaper versions of the ads ran in The New York Times and The Washington Post this week. The advertising campaign is part of an effort by the American Humanist Association to reach out to like-minded individuals around the nation’s capitol and elsewhere who might be interested in humanism. The atheistic group espouses the belief that one can live a moral life apart from a belief in a god or the afterlife. Oh well, let me wish a Merry Christmas to all my humanist friends anyways! The London Times reports on the new Atheist Bus Campaign sponsored by prominent atheistic writer Richard Dawkins. “There’s probably no God. Now stop worrying and enjoy your life.” That is the cheery message London buses will be carrying if Richard Dawkins, the atheist, can raise enough cash. The slogan is to be daubed across 30 Westminster buses in retaliation for a series of bendy-bus Christian messages. CBS Outdoor, the bus advertising company, said that it would run the atheist ads in January. “Religion is accustomed to getting a free ride,” said Dawkins, who will match donations up to £5,500. I would have to say that I worry less and enjoy life more knowing there is a God than I would if there wasn’t a God. Now compare Dawkins’ bus slogan to the closing words of Ecclesiastes and decide which is true wisdom. Many people believe that some kind of God exists. But to them He seems remote. For practical purposes science, they think, has replaced God. The wind blows because of differences in air pressure. The nightly weather report explains it. And what the nightly weather report doesn’t explain, the expert scientists could explain and explain in massive detail until your eyes glazed over. So was it just a primitive mentality when the Bible said that God made the wind blow? No. The scientists still deal with the same God, the God who rules the wind. What the scientists investigate is the regularity and faithfulness of the way in which God makes His wind blow. He is so faithful and so consistent that you can write mathematical equations to describe it. And of course the mathematical equations come from man’s mind being in tune with God’s mind, and having the privilege of thinking God’s thoughts after Him. Christian author Dinesh D’Souza debated prominent atheist Christopher Hitchens last October in New York. During the debate Hitchens raised a point for which D’Souza had no immediate answer. Here’s what Hitchens said. Homo sapiens has been on the planet for a long time, let’s say 100,000 years. Apparently for 95,000 years God sat idly by, watching and perhaps enjoying man’s horrible condition … Then, a few thousand years ago, God said, “It’s time to get involved.” … Here is the thrust of Hitchens’ point: God seems to have been napping for 98 percent of human history, finally getting his act together only for the most recent 2 percent? What kind of a bizarre God acts like this? D’Souza recently found a satisfying answer put forth by Erik Kreps of the Survey Research Center of the University of Michigan’s Institute for Social Research. An adept numbers guy, Kreps noters that it is not the number of years but the levels of human population that are the issue here. The Population Reference Bureau estimates that the number of people who have ever been born is approximately 105 billion. Of this number, about 2 percent were born in the 100,000 years before Christ came to earth. John Piper provides the following sample of scriptures bearing witness to God’s complete providence in governing the world. “The Lord God appointed a plant and made it come up over Jonah” (Jonah 4:6). “God appointed a worm that attacked the plant, so that it withered” (Jonah 4:7). “I will send swarms of flies on you and your servants” (Exodus 8:21). “He summoned a famine on the land and broke all supply of bread” (Psalms 105:16). “He gave them hail for rain” (Psalms 105:32). “He spoke, and the locusts came” (Psalms 105:34). “The Lord will whistle for . . . the bee that is in the land of Assyria” (Isaiah 7:18). “Even the wind and the sea obey him” (Mark 4:41). “He removes kings and sets up kings” (Daniel 2:21). “Even the unclean spirits, and they obey him” (Mark 1:27). “He upholds the universe by the word of his power” (Hebrews 1:3). What a comfort it is to know that God governs all things in the world, both big and small. I don’t usually begin my sermons with a joke, but last Sunday I did. Here it is in case you missed it. 3) the existence of God. What one question would you ask God?